Health care costs are a substantial and growing burden for many people on Medicare and are projected to consume a larger share of total income over time, according to a new analysis from the Kaiser Family Foundation. The study, Medicare Beneficiaries’ Out-of-Pocket Health Care Spending as a Share of Income Now and Projections for the Future, finds that more one-third of people with traditional Medicare spent at least 20 percent of their total income on out-of-pocket health care costs in 2013. That included premiums, deductibles and cost sharing for Medicare-covered services, as well as spending on services not covered by Medicare, such as dental and long-term care. The analysis of spending as a share of total income does not include enrollees in Medicare Advantage plans, who account for 19 million of the 59 million people with Medicare. Income is measured on a per person basis, which for married couples is income for the couple divided in half. 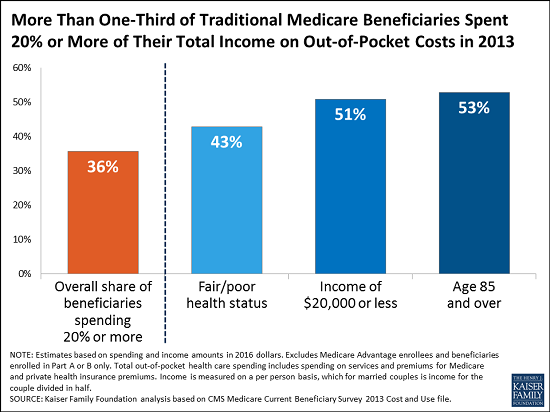 While some people with Medicare face relatively low out-of-pocket costs, the financial burden can be especially large for beneficiaries with modest incomes and significant medical needs. For instance, among beneficiaries in traditional Medicare, just over half with incomes below $20,000 and those ages 85 and overspent at least 20 percent of their total income on health expenditures in 2013, along with more than 4 in 10 beneficiaries in fair or poor health status. Among all Medicare beneficiaries, out-of-pocket costs consumed 41 percent of beneficiaries’ per person Social Security income in 2013, on average. Older women and beneficiaries ages 85 and older tended to have higher average out-of-pocket spending as a share of average Social Security income than others, according to the analysis. The analysis projects that the health care spending burden among Medicare beneficiaries will rise over time. By 2030, the study projects that under current policies 42 percent of people with traditional Medicare will spend 20 percent of their total income or more on health care costs. Among all people with Medicare, out-of-pocket costs are projected to consume half of the average per person Social Security benefit by 2030. With rising health care costs representing a growing challenge to the financial security of older adults, these findings have implications for policies that could shift costs on to beneficiaries as part of a broader effort to reduce federal spending on Medicare, Medicaid or Social Security. Medicare helps pay for the health care needs of 59 million people, including adults ages 65 and over and younger adults with permanent disabilities. Even so, many people on Medicare incur relatively high out-of-pocket costs for their health care, including premiums, deductibles, cost sharing for Medicare-covered services, as well as spending on services not covered by Medicare, such as long-term services and supports and dental care. The financial burden of health care can be especially large for some beneficiaries, particularly those with modest incomes and significant medical needs. Understanding the magnitude of beneficiaries’ current spending burden, and the extent to which it can be expected to grow over time, relative to income, provides useful context for assessing the implications of potential changes to Medicare or Medicaid that could shift additional costs onto older adults and younger people with Medicare. In this report, we assess the current and projected out-of-pocket health care spending burden among Medicare beneficiaries using two approaches. First, we analyze average total per capita out-of-pocket health care spending as a share of average per capita Social Security income, building upon the analysis conducted annually by the Medicare Trustees. Second, we estimate the median ratio of total per capita out-of-pocket spending to per capita total income, an approach that addresses the distortion of average estimates by outlier values for spending and income. Under both approaches, we use a broad measure of Medicare beneficiaries’ total out-of-pocket spending that includes spending on health insurance premiums, cost sharing for Medicare-covered services, and costs for services not covered by Medicare, such as dental and long-term care. We present estimates of the out-of-pocket spending burden for Medicare beneficiaries overall, and by demographic, socioeconomic, and health status measures, for 2013 and projections for 2030, in constant 2016 dollars. In 2013, Medicare beneficiaries’ average out-of-pocket health care spending was 41 percent of average per capita Social Security income; the share increased with age and was higher for women than men, especially among people ages 85 and over. Medicare beneficiaries’ average out-of-pocket health care spending is projected to rise as a share of average per capita Social Security income, from 41 percent in 2013 to 50 percent in 2030 .